Bonnie MacDonald is thrilled to be going to a beautiful tropical island with the rest of the Amelia Earhart Cadets, especially as the only adult present will be the incredibly glamorous Layla Campbell, nicknamed the Duchess, who treats them all like adults. But the dream holiday becomes a nightmare - after landing on the wrong island despite dire warnings from the boatman who took them there, a storm kills him and one of Bonnie's friends and wrecks the boat, leaving them trapped with no-one knowing where they are. With the Duchess shining rather less brightly as she’s revealed to be practically useless in the face of danger, it's left to Bonnie and her friend Jas to try and keep the remaining girls alive and find a way to be rescued. This is a truly spine-chilling story, mainly because it always seems completely believable. 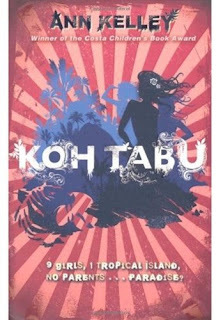 It's set against the backdrop of the Vietnam War - the girls are the children of soldiers based in Thailand - and as well as being stranded on the island, the survivors have to cope with not knowing whether their parents are alive after they see explosions in the distance. With this in mind, the disintegration of the recently widowed Mrs Campbell seems utterly plausible, as does the way Bonnie and some of the other girls are forced to take responsibility for themselves so quickly. I don't think I can honestly say I particularly liked Bonnie - a couple of decisions she makes have horrendous consequences, and one in particular will cause a wide range of reactions from teenagers and adults reading, ranging from those who will completely agree with it and those who will be absolutely horrified by it - but I've rarely felt a narrator was so well-drawn. Even when she's considering some steps which would appear absolutely ridiculous in the hands of a lesser author, I was still convinced it was completely the right thought process for her character as Ann Kelley describes her. The character development of Bonnie is excellent, and the descriptions throughout the book are superb, especially those of the plants and animals of the island. This held me completely spellbound from beginning to end as I raced through it, desperate to find out what happened to everyone. It’s also very thought-provoking indeed – I still can’t work out whether I think Bonnie was right to make the decision I referred to above, and I’d imagine it’s likely to provoke some interesting discussions between readers. This is an extremely high recommendation – with the warning attached that it’s not something I’d give to young or easily scared teens, especially if you’re ever planning on taking them on a boat trip or to an island!